This is Wes (L) and Scott in 1988 or ’89. They no longer have this much hair. There are a lot of things I could tell you about my guest for this episode – and I say that not because he’s notorious, but because I’ve known him since high school. 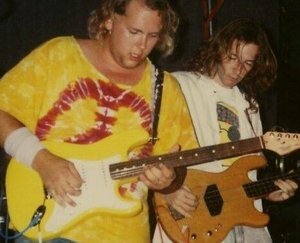 Scott Auld and I were both musicians back then (he is still actively so, while I am mostly dormant) and we even played in a rock band together for a couple of years. Life took us in different directions, and his direction was south Florida, where he’s been for 25 years or more. A couple of years ago, Scott started emailing and texting me with questions about motorcycling. It wasn’t long before he got his first bike – I don’t want to spoil the story for you, so you’ll have to listen to Episode 24 to get the details – and now he’s one of us. We’re all a bit like Scott, and he’s a bit like all of us, which is why I call him a motorcyclist just like you. You can read a guest post Scott wrote for this site with his piece “Beginning at the beginning,” which looks at how he first got into riding. Scott is also a podcaster, but video is his legerdemain and YouTube his outlet. It was one of his videos that inspired this episode. In it, he talks briefly about 10 or 11 things he knows now that he didn’t know before he started riding. I thought when I saw that video that it would make a great topic for an episode of Chasing the Horizon, especially since I could give Scott a chance to expand on some of his items. In a way, I really wanted to engage him on what it feels like to be a “young” motorcyclist with just a few years of experience. In some ways, I look at my own life as a motorcyclist and there are times – especially when I seem to spend more time fixing my motorcycles than riding them – when I forget that riding is supposed to be FUN. I encourage you to check out Scott’s YouTube channel (link below) and dip your toes into the YouTube motorcycle podcasting community – I think they used to call it “vlogging” as a play on the word “blogging” but I’m not terribly cool any more and I don’t know what the kids are calling that style of content creation. Now, a bit of logistics. I already made this announcement on the mailing list (you have signed up for that, haven’t you? if not, see the link below) but I’ll make it here as well. After consulting with friends (including Scott) and some podcasting colleagues, I’ve decided NOT to take an extended break this summer. Instead, I’m going to modify my podcasting schedule for the summer and keep putting out fresh episodes. I don’t know how many and I don’t know when I’ll release them, but they’ll be out. I guess when I feel like I’ve got something to say and someone to talk to about it, I’ll post. In the meanwhile, I’ve got some motorcycle travelling planned and I’ll be out there on the roads of the USA. 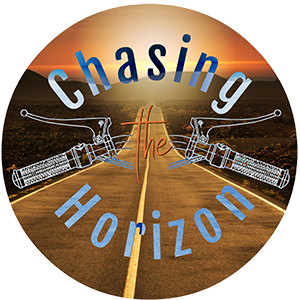 Thanks to EVERYBODY who has listened to Chasing the Horizon in what I can only call its wildly successful first season. The 23 (now 24) episodes of the show have been downloaded, streamed, heard, whatever you want to call it over 32,000 times. That is simply a staggering number, and I MUST thank ALL OF YOU for sticking with me on this experiment. I guess at this point it’s not really an experiment any more – it’s working pretty well. The summer episodes will be part of Season 1, so you’ll see the familiar graphics and hear the familiar music for the show at least through July or August. I’ve got a graphic designer working on new logos and my friend Brian Hinton has sent over some new music that I’ll be using once I decide which of his awesome clips works best for the show. Because my discussion with Scott ran so long, it’s the only thing in this episode. 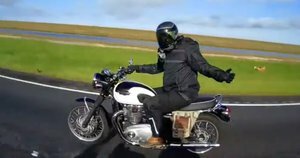 I’ve included links for the news articles I would have told you about – because come on, you gotta get your Royal Enfield news somewhere!! Do riderless motorcycles have a place on the grid? This British website thinks they do. Scott’s video podcast – Amen Moto. Follow his social media links to win glorious prizes! I’ll see you out there somewhere on the road – or off it! Ride safe and tell your friends about Chasing the Horizon. Hi Wes. I have been listening to your podcasts here in Australia and need to correct a couple of statements made when you chatted with Scott Auld. 1. In Australia Bikies are the Patch clubs like the Rebels, Hells Angels, Finks etc. Bikers are the remainder of our bike riding population. 2. I have never seen anyone waggle their foot to greet fellow riders. Maybe that is the Harley, highway peg riding guys who don’t generally wave to anyone not on a Harley. The appropriate greating is to nod your Helmet or a quick raise of the left hand in a greeting. On a positive I enjoy listening to the podcasts in the car on trips but don’t have anything going into my ears other than ear plugs when I get my peaceful riding time to de-stress and to tour and go to Rallies when possible. I currently own the R100RS, an 83 CX650E Honda and a 2014 VSTOM 1000.